Hey guys!! 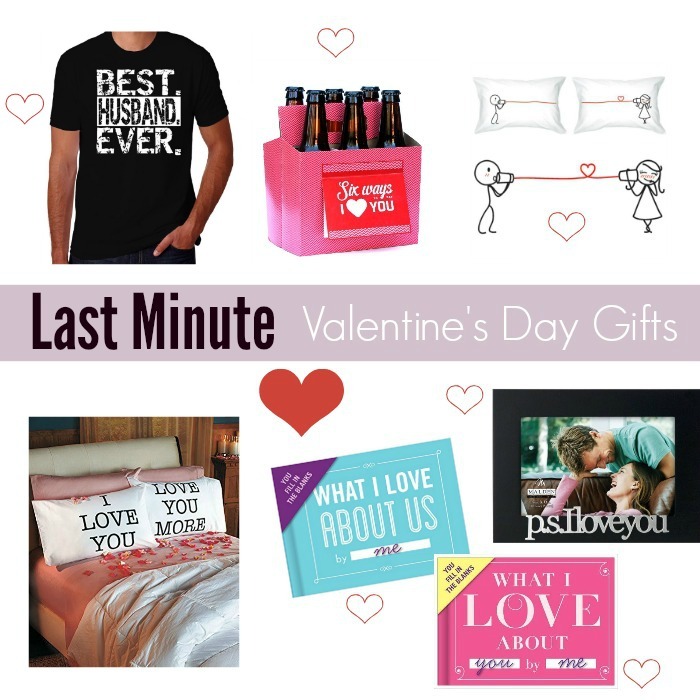 Today I'm here with a list of the top (and last minute) Valentine's Day gifts for him. The following Valentine Gift ideas are all $27 or less! Plus, they all have available 2-Day Shipping, which is free if you're an Amazon Prime member! I can't speak on behalf of Amazon, but if you order soon they should arrive on time. 1) Best Husband Ever Tee -$16.99 : This is great valentine gift idea for just about any husband out there. Make them feel loved and enjoy watching them laugh when they open it! A lot of similar shirts are quickly going out of stock on Amazon, so if you like this shirt I recommend you hurry and order one! 2) Six Pack Greeting Card Box -$15.95 : No one has time to make a DIY Beer Holder from a Pinterest tutorial. Here the work is done for you, and did I mention that it's also a card? Freaking innovative! 3) BOLDLOFT® "Say I Love You" His & Hers Couples Pillowcases -$26.99 : I've bought these for Anniversary gifts and everyone always mentions how cute they are! If you have a more sensitive guy in your life, this is definitely a great valentine gift idea to get him. (It might also stop him from using your pillow). 6) What I Love About You Journal - $10.00 : I bought one of these for my boyfriend a few years ago, and he loved it! You fill in blank sections of the journal yourself so it's personalized for whoever you're giving it to. Definitely a great sentimental valentine's day gift idea if you're looking for one! 7) P.S. I Love You Picture Frame - $14.99 : One of the easiest Valentine gift ideas out there is placing a picture of you and your loved one inside a frame. This frame is only $15 and is very classic looking, allowing it to work with almost any indoor decor. Hopefully this list has relieved your stress in the search for that perfect last minute Valentine's Day gift! If you have any other quick V-day gift ideas, feel free to share them in the comments below. I'd love to hear them!